On July 5th, Alton Sterling was killed by Baton Rouge police while selling CD's outside a convenience store. That same week, Philando Castile was killed by Minneapolis police after being pulled over for a broken taillight. Castile's girlfriend, Diamond Reynolds, and her young daughter, were in the car at the same time. 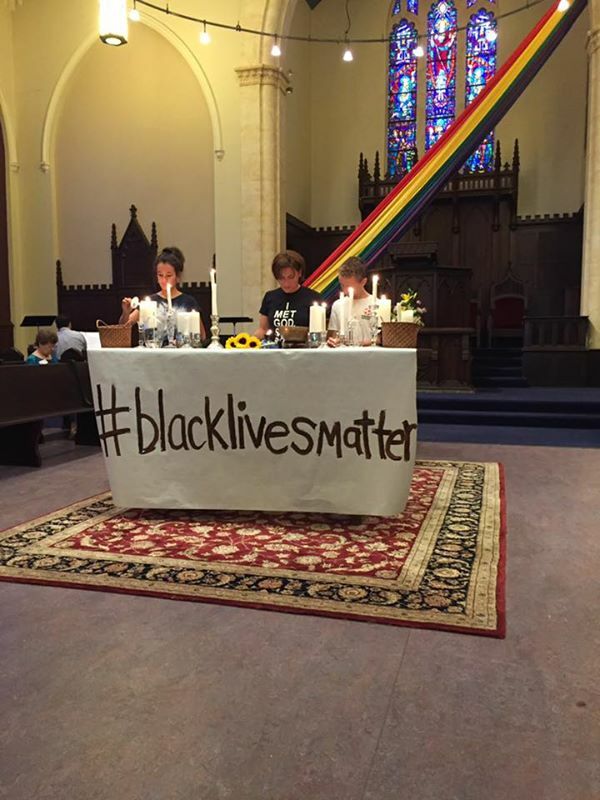 On July 10th at Church of the Pilgrims, our liturgy proclaimed #blacklivesmatter. Yet we are a nimble bunch. When something horrific happens during the week, we are able to tell the horrific story by making last minute changes to the liturgy. While the structure might stay the same, the content or actions or songs might shift to reflect what's happened to the planet. This is what we did on July 10th. We scrambled around that morning, placing 12 candles on the table, filling the font with floating candles, making two #blacklivesmatter banners. One banner went around our communion table. The second one hung from our choir loft. We had 12 candles on the table to name 11 African-Americans who were killed by police. While the list of African-Americans killed by police is longer than 11, I picked 11 names that were listed in a Washington Post article in early July. We added a 12th candle to represent the many others who have been killed. Sam and Emma light candles for #blm during our prayer for illumination. During our prayer for illumination, two of our youth, Sam and Emma, helped to light the candles while I read the names. We read a few names, sang a song, read a few more names, sang the same song again, read a few more names, closed with the song. This moment was slow and contemplative. Rachel Ford, our summer intern, was set to preach on excerpts from the Book of Job. Rachel kept the Job texts, pulling in more of her own story of naming, claiming, and resisting the social construction of whiteness. During prayers of the people, we read the names again. Eleven people in the congregation took turns calling out a name and this time we added the object that was connected to their death. We also read the names of the five police officers killed in Dallas during a peaceful #blacklivesmatter march. I asked two of our elementary aged kids to read two names of African-Americans killed by police during prayers of the people. This is what happened with one of our kids. turned his shirt inside out. His shirt had a Super Dino cartoon on it and Super Dino was holding a gun. Pilgrim kid thought it would be inappropriate for him to read a name while wearing the t-shirt. He turned the shirt inside out. When we include kids in liturgy, when we ask kids to participate in meaningful ways in liturgy they have something to react/respond to. Inviting creates a structured moment, giving kids the experience of making a choice and a decision about how they will respond to the invitation to participate. In Pilgrims nimble state, we were able to organize our religious life around the killings of Sterling and Castile. In inviting people to read names, especially two of our Pilgrim kids, folks were able to interpret their individual lives and Pilgrims around #blacklivesmatter. -from American Skin (41 Shots), Bruce Springsteen. Our Pilgrim kid was given the experience to interpret his clothing and actions in relationship to #blacklivesmatter. This is how our liturgy constructs identity and worldview, and how liturgy can give us the choice to enact those identities and worldviews in order to create a world made new.